A Fresh, Feminine Office Redesign for Tiffani Thiessen by Rowe Fine Furniture — Cole's Appliance and Furniture Co. Elegant. Feminine. Elevated. Flirty. Fun. That’s the feeling, in five simple words, that Tiffani Thiessen wanted to capture for her recent collaboration with interior designer Kristin Alber. The space–a total office redesign incorporating many of our favorite custom upholstered pieces from Rowe–is an absolute stunner, and we are now thrilled to share the project reveal with you! Tiffani, a multi-passionate creative whose career highlights include actress, lifestyle influencer, cookbook author and more, needed a fresh, feminine makeover for her home office. On her must-have list: plenty of plush seating surfaces for guests and family. To provide maximum comfort and style, Kristin selected a variety of upholstered pieces from Rowe in a bold, luxe palette that is sure to inspire Tiffani’s next wave of creativity. Located in her sprawling 1920s-era residence (previously the home of Jack Warner, head of Warner Brothers Studios, it has hosted countless members of Hollywood royalty over the years), Tiffani’s office includes a sitting room and powder room, and is located just steps from her children’s rooms–another absolute must for this hands-on mom! The Macy sofa by Rowe makes a bold statement here in stunning navy velvet, and was one of the first items Tiffani selected for the sitting room. Kristin complemented this look with a Persian-inspired traditional rug in modern feminine pastels, as well as additional seating from Rowe. “The Gigi ottomans and Pate chair in beautiful muted tones were a perfect fit for an area that needed extra seating,” said Tiffani. Visitors to this lovely office will have no shortage of stylish options for sitting! To complement the tufted texture and luxurious velvet on the Macy sofa and Pate chair, everyone agreed the room needed something clean and classic for balance. A marble-topped round coffee table was just right for the space, providing a strong visual element that doesn’t distract from the soft beauty of the surrounding upholstered pieces. As in every well-designed space, the furnishings may be the star of the show, but it’s the accessories that truly pull the look together. This project definitely delivers in this category, with charming details around every corner. “The room had beautiful built-in bookcases that are full of so much character! We complemented Tiffani’s existing book collection with decorative books, personal photos, and mementos like vintage cameras that belonged to Tiffani’s parents,” said Kristin. Near the bookcases is a charming little nook that leads to a secret room, currently used to create a reading and music area where the kids can cozy up and read while Mom is working in the office. Now that’s what we call work-life balance! while Mom is working in the office. Now that’s what we call work-life balance! As this room is a shared office for Tiffani and her longtime assistant Tory Sparkman, the main design challenge in this workspace was figuring out the best way to fit in two desks and a sofa, all while maintaining the bright, airy openness of the room. The solution? Two custom designed pieces–a desk and console–that provide a chic, elegant match for our Oslyn chair. “We loved that we could pick the color we wanted for the office chair, as we wanted something romantic to go with the desk,” said Tiffani. The Oslyn chair in a delicate blush pink added just the right note of muted elegance. Working in her signature eclectic modern style, designer Kristin Alber created a space that feels elevated and elegant, but also kid-friendly and highly personal. Clean, crisp white walls allow the furnishings and artwork–Tiffani’s husband, Brady Smith, is an accomplished painter whose work is featured throughout their home–enough room to shine. Custom-built case goods, piles of plush pillows, and luxe finishes such as warm brass, bronze and marble give this home office a truly personalized glow that reflects the innovative powerhouses that dreamed it up. 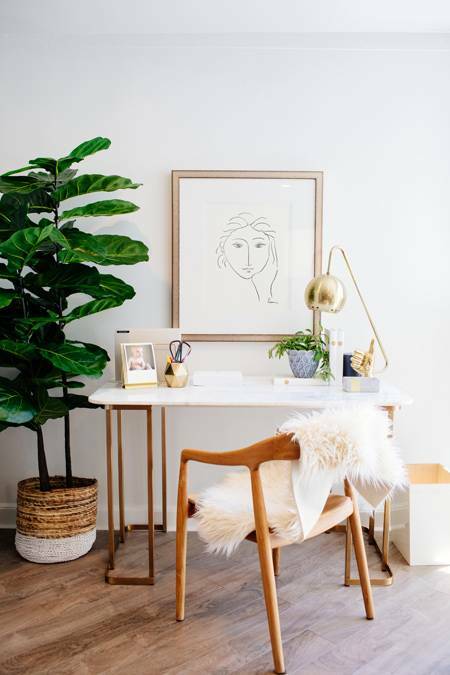 We’re proud to see our Rowe products showcased in such a beautiful setting, and can’t wait to see what new creative projects of Tiffani’s are inspired by this gorgeous office!